PROPCAFE believe we need to be flexible, adaptable in order to stay abreast of the face pace changing world. Especially when you socialise with current new generation or what we call as gen y (millennial generation), their ideas to certain extend are stark different compared to their predecessor, baby boomers and generation X. What seems to be normal in the past may not seems so in near future. Just classic example previous generation they live by philosophy of “live to work” or “work to live” however for millennial generation, they are swear by philosophy of “live first, then work”. There are changes of lifestyle where to certain extend, there is a blur line between work and personal life and it may even convoluted all in one. 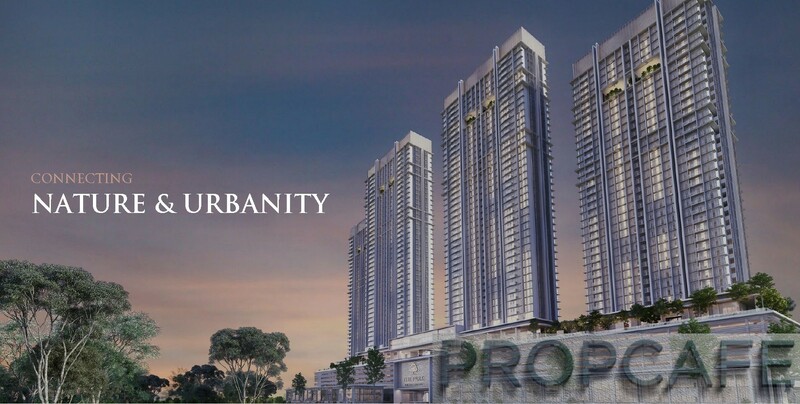 For our loyal readers that follow us from beginning till now, PROPCAFE not only strive to bring latest property review for our readers, PROPCAFE always try to think out of the box and this is where it bring readers to The Rev.O @ Bukit Jalil City. From the time where The REV.O @ Bukit Jalil City review was published towards end of last year, some of the project development has changed and in fact some features are updated. 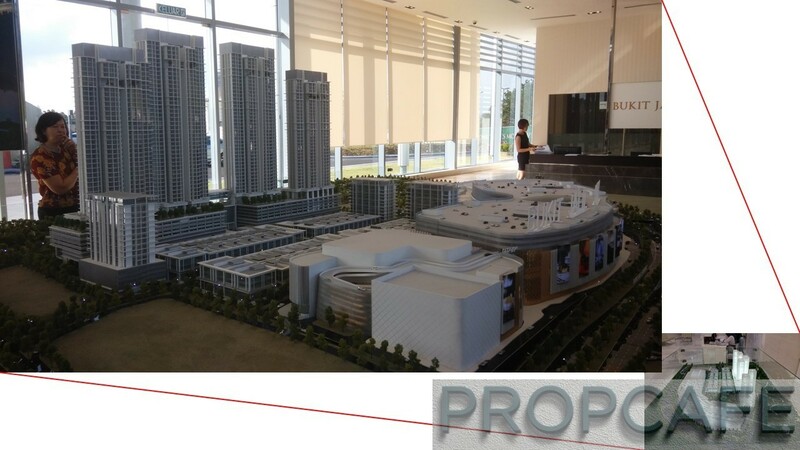 The most important of all reasons, PROPCAFE felt despite the elaborate first review, it didn’t do justice on the REV.O @ Bukit Jalil City as many readers were clueless about the investment strategy, space utilization and exit plan. Hopefully this review would able to assist readers in their buying decision making. What has happened since end of last year? For a start, the masterplan of overall Pavilion Bukit Jalil City overall masterplan has been updated. From the latest master scale model, 6 blocks of residential it has been reduced to 4 blocks. Sitting on prime freehold 7.3acre, the Park Residence consists of 1098units in 2 blocks 46 storeys and 2 blocks 40storeys. 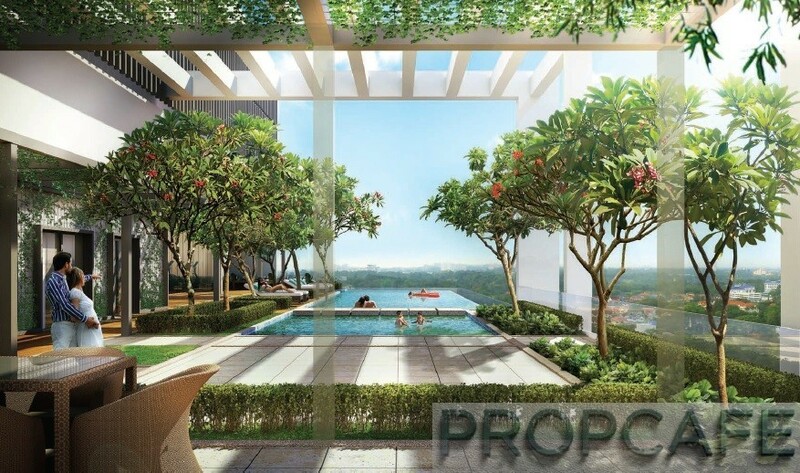 Selling from RM715,000 or RM780psf, it been launched to rave response from the buyers. There are 3 typical types of layouts the buyers can choose as follow typical 8 units/floor. There are more clarity of how the façade of Pavilion Bukit Jalil Mall how it looks like now. 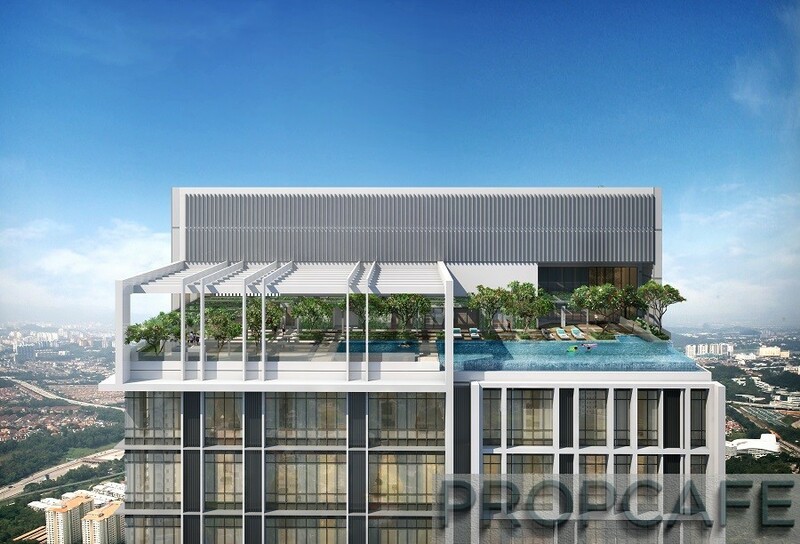 When PROPCAFE browsed the Pavilion Bukit Jalil’s website, the slogan “connecting LIFESTYLE, LIVING AND LUXURY with COMFORT” simply struck the chord. 20-30 years ago, double and singles storey houses are the most common form of residential properties. Similarly with two or three storeys shoplots where residents fulfil their daily needs from groceries, restaurants and clinics. It evolved with standalone malls where residents and shoppers are looking to shop at comfort under one roof. Along the way the strata living mushrooming in Klang Valley with Serviced Apartment and Condominium sprouting from early 2000. The evolution of the property doesn’t end there with integrated development is taking lead where at least 3 components (residential, office, retails/shops, hotel, recreation, connectivity etc) are integrated in single development. 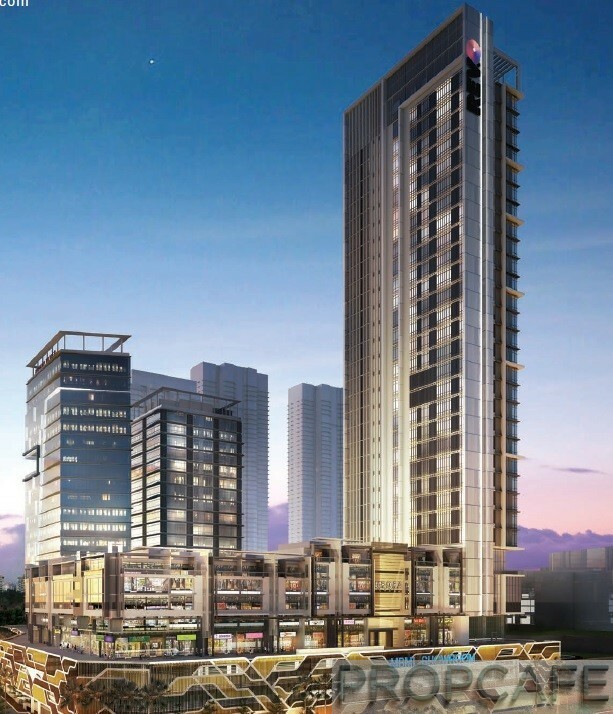 Notable project such as KL Sentral, Tropicana Gardens, Solaris Dutamas, Ekocheras, KL Gateway, Empire City, Midvalley City, Pavilion Bukit Bintang etc. Some of these developments are even linked with public transport such as LRT, Monorail, MRT etc. These offer a seamless lifestyle to the workers, residents and shoppers where connectivity, security, conveniences and living are under one roof. Precisely the changes of behaviour and mindset of young buyers have drive developers to be innovative with their development in order to meet the desired lifestyle of these discerning young homebuyers. Smaller intelligent houses with flexible space usage and layout are the current trend where more time will spent outside and this just work well with integrated development where retails, F&B, connectivity and under one roof. 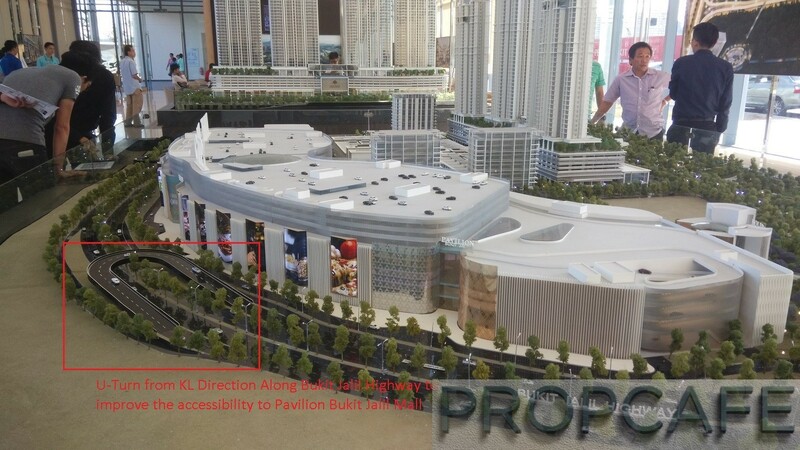 Despite the introduction of Aurora Place and Pavilion in previous review, PROPCAFE didn’t accentuate the impact of these development in REV.O @ Bukit Jalil City. With about 64 Shoplots in Aurora SOVO under the same roof and 2 millions NLA of malls there are myriads of retails that will serve the daily needs just within your footstep. With the increase of purchasing power of Generation Y and Z, they are storming into the market with their lifestyle and not surprising, these developments have been doing well and in fact have been transacted premium compared to bread and butter properties vis-a-vis similar location. 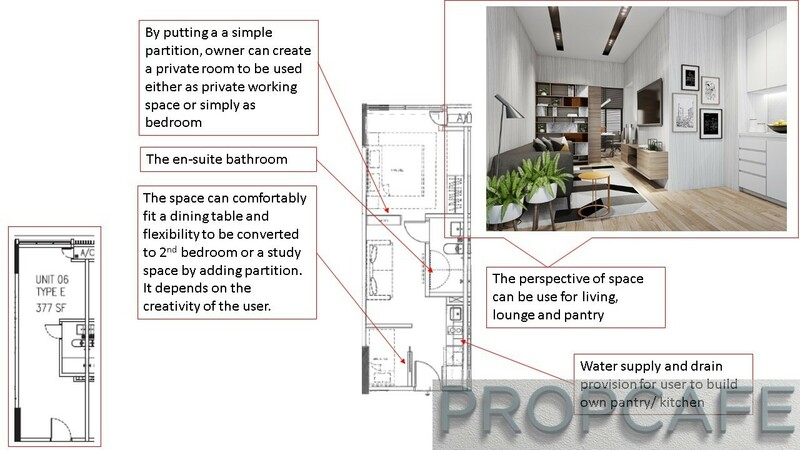 The new emergence of new breed of product such as SOHO, SOFO and SOVO basically allow the owners or the tenants the flexibility to use the space as they wish. The line between work, live and sleep are even blurred where they can work in the night or sleep during the day. In fact the meeting can be carried in Designer Café Shop (You guess it, just across the door!). 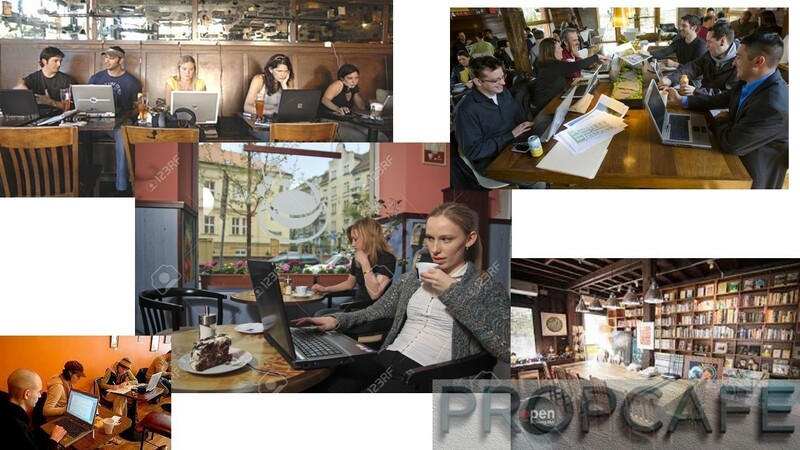 As long as the venue has WIFI connection, you can use CLOUD storage such as Google Drive and Dropbox to share your work, Do presentation or having conference call via WEBEX or Lync, or just a simple meet up with acquaintance in café over a cup of coffee. The evolution of working culture – The world is your oyster! 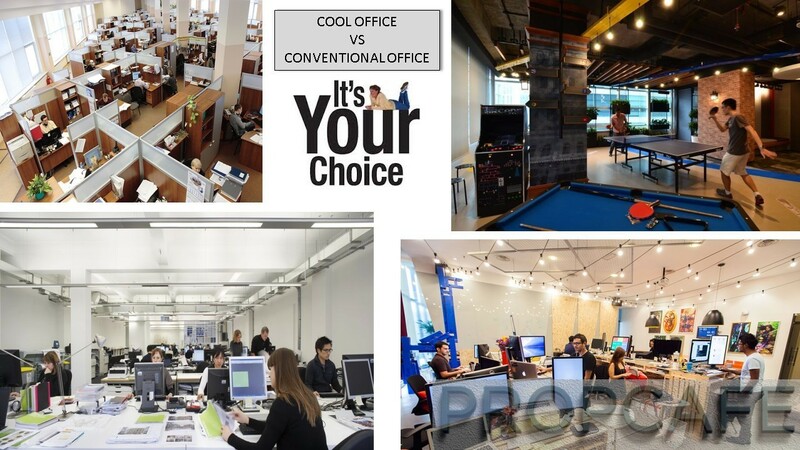 Breaking away from conventional office setup, it is dream for these young generation to work in a cool office. Maybe the intention is so that the employee really want to stay back to work, sleep and dream in the office! Some of the cool office are in the link below. So, which category you are? What if you need to chill from work? Just hop into the lift and go the rooftop REV.O@ Bukit Jalil City. There is lounge, swimming pool where you can chill and take your time off from work. Chit-chat with your colleague or some casual conversation with newly met acquaintance. With disruptive innovation such as UBER (https://www.uber.com/) and MyGrab Taxi (http://grabtaxi.com/) , you may not even need a transport of your own if you need to travel out of your cocoon. Just grab your smartphone and start to use your apps to get a transport. Just read the experience of the people who have used the Apps and all of them raved about the affordability, simplicity and convenience of the technology. Even though are 2100 of carparks spread over 3 level of basement parking under the Aurora Place, the residents may not need to get own car afterall with most of the amenities just next door. It is the progression of technology and lifestyle afterall. 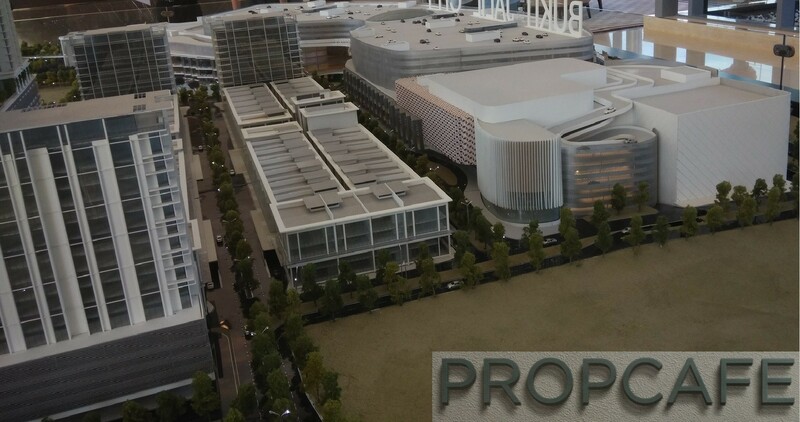 PROPCAFE cherishes the challenge of thinking out of the box and in our first review of REV.O @ Bukit Jalil City by MBM Land, PROPCAFE has been inundated with questions with what owners could do with the mickey mouse unit where some feels there is not enough space to even swing a cat. 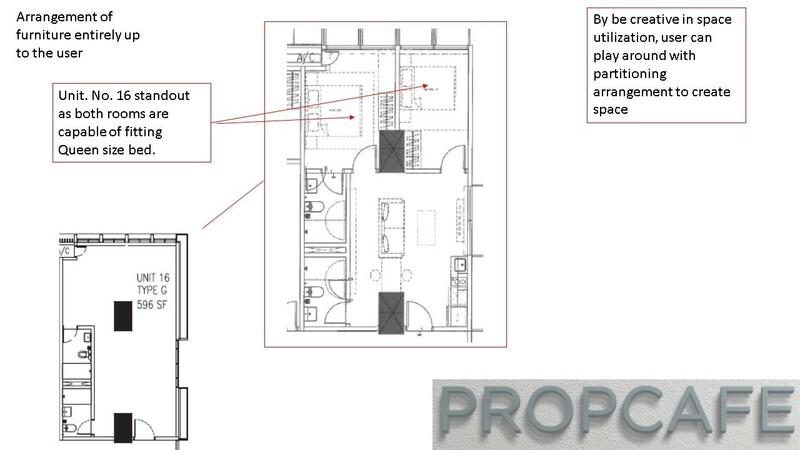 From feedback of the readers PROPCAFE noticed that some of these readers couldn’t visualize what they could do with the space despite the elaborate description in the previous review. Evolved lifestyle and working culture will require unconventional product. As office usage, you do not need to adhere to specific purpose for the space such as manager room, meeting room etc. If you need to have a meeting with large group of people, there are choices of café with private meeting room etc. You can have cozy lounge with large tv and smart multimedia that can be used as entertainment or as tele presence. The compact lifestyle suites will be suitable for creative, IT, accountant, multimedia and broadcasting,, fashion, Online Retailers etc. How about non-office usage? PROPCAFE found this is very interesting as the space comes with ensuite bathroom and provision such as water supply and drain and electricity outlet for proper kitchen, the space is flexible not only for work but for living as well. Just take example of lifestyle suite no. Unit 6 and 8 (377sf), lifestyle suite no. 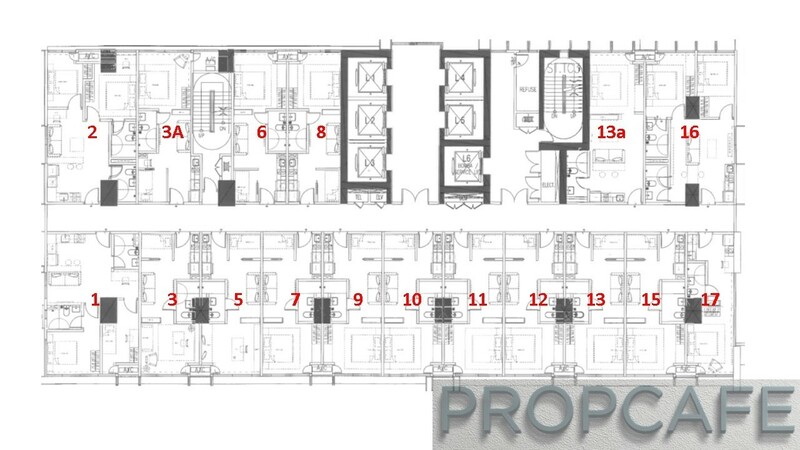 3,5,7,9,10,11,12,13 (384sf) and lifestyle suite no. 15 (402sf) with smart partitioning, you can easily create 2 rooms. You can use the room as bedroom or as workspace and study room. Similarly, the space in lifestyle suite no. 3A (406sf) and lifestyle suite no. 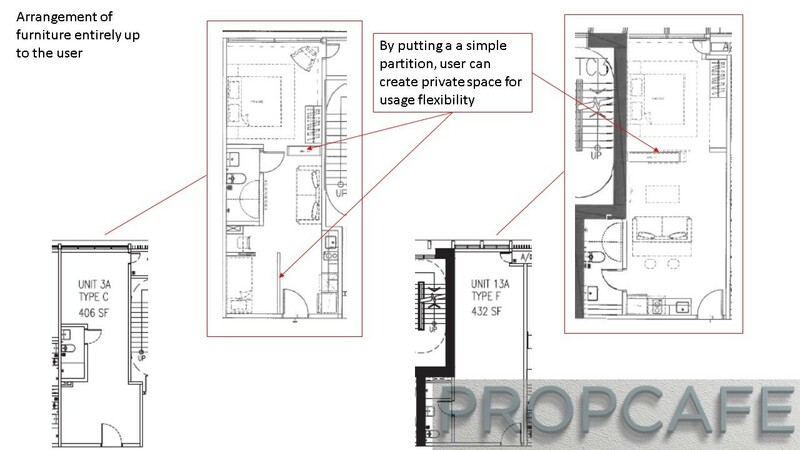 13a (432sf) can be easily converted to flexi usage with furniture arrangement entirely up to the user. In fact if readers are asking PROPCAFE, we over here feel the most interesting layout will be those corner lifestyle suite no. 1 (597sf) and lifestyle suite no. 2 and 16 (596sf). Essentially being the corner units, there are more flexibility and each space has more sunlight which will make the space roomier. It is fascinating that for space measured less than 600sqft, the unit is able to provide a space provision for 2 bedrooms and with one of the rooms with ensuite bathroom and another common bathroom. 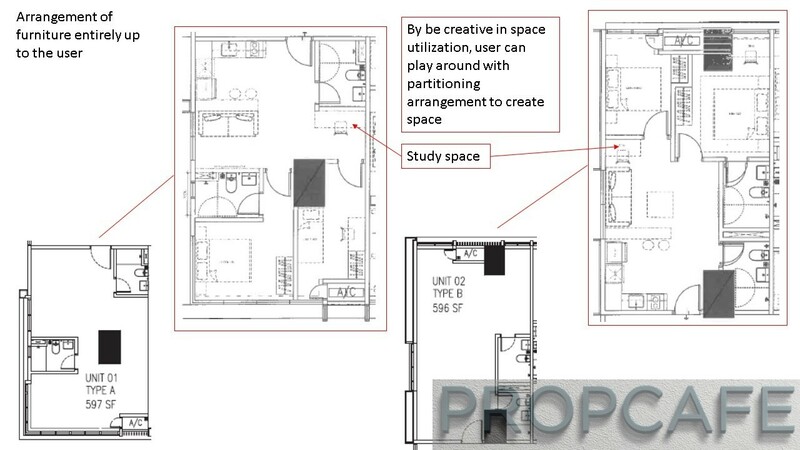 Just on extreme scale, some development with similar amount space, the space is only able to fit a single bedroom due to constraint of layout or/and bathroom. Most buyers when hunting for prospect properties they are focused on the pricing in term of PSF which is not a wrong thing to start however as pricing is not the absolute criteria. The location, product and concept and what is the future prospect and catalyst are playing big role in buying decision. It is understandable SOVO and SOFO is a controversial product and it is apprehension from buyers of the product. This already covered during the Part 1 review of REV.O @ Bukit Jalil City however in PROPCAFE’s personal view, the buying decision should be as holistic view as possible considering what the product could offer to the end users and what return to be expected is. With change of lifestyle and way of the live-work-play evolved, the rigid space may no longer relevant in the near future. Flexibility maybe the way looking at how our society will be evolved. Buyers should be noted that from1.April. 2015, 6% GST is applicable to all commercial properties and this means that buyers need to include the GST in their purchasing decision. REV.O @ Bukit Jalil City is an unique product located within Bukit Jalil City and just 1 minute walking distance to Pavilion Bukit Jalil. From the perspective of absolute pricing, REV.O @ Bukit Jalil City is the most affordable property among all the launches in Bukit Jalil City. The compact size properties has been doing well so far versus larger unit as this allow the owners to rent out as the lowest absolute rental due to the lowest entry prices. They also could be more flexible in the subsale as well versus their larger size cousin. 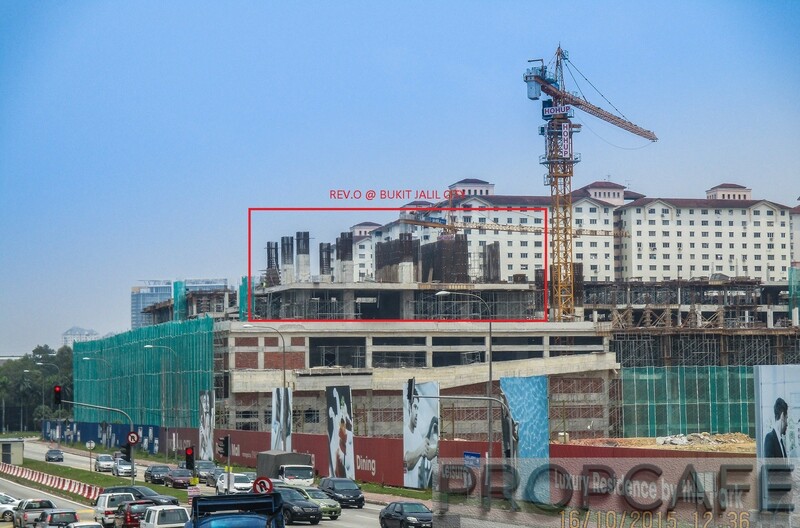 The construction of Rev.O @ Bukit Jalil City is progressing well with the structural is coming up nicely, If developer yet to take over from Hop Hup, it should be anytime soon. can we actually stay in a sovo? i thought sovo=small office versatile office? For me, it is just plainly for office/commercial usage. If they can be use for home purpose, why not they come out with soho?bt sovo instead? 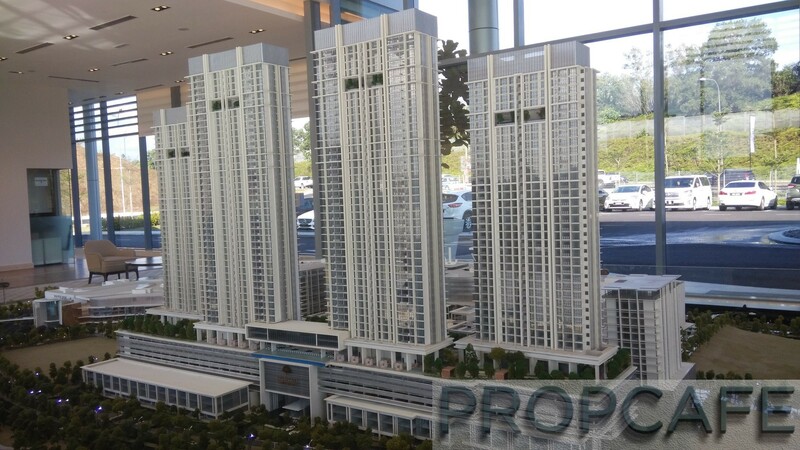 If residential title is a must, there are always a option out there even in Bukit Jalil City itself… For a start, Park sky Residences are for sale from RM715k, twice the price of Rev.O…. Personally i think it is a balancing act between risk appetite, reward and your understanding of the game. 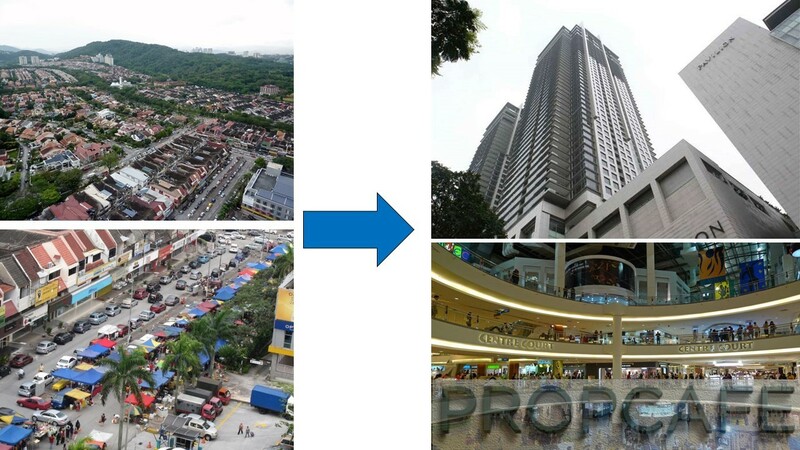 When dbkl allocate licences to build…they have quota for commercial office or residential. Obviously this bukit jalil city is earmarked for commercial (note: commercial including hotel accomodation). To change the commercial usage to residential usage might not be easy, and might cost money or simply wont get approved. Beside…commercial offices get better loan approval (80% or above) whereas residential usually 70%. Its much easier to sell as office. The building requirement also simplier (no need kitchen, bedrooms and other facilities). Its apparently win-win for both developer n buyers. Whether ultimately can be used as full flesh resi…it depends on the rulling n jmb at that time. As of now…everybody is happy. sorry but this is a rip off, shoe box units at sorry psf, whatever u guys say, PSF matters for the sake of economics. SOHO, SSOVO are just developers ripping users of by maximizing their adressable market. Remember we are and still heading to an oversupply condo market. Larger units in BJ area are going for 1-1.5K rent some even furnished. Size matters. If you take cognisance from singapore experiance, the upper hand luxury large properties and shoebox units are worst affected in terms of resale & rent. The 900-1200 sqft units are always the safest bet. It would b rather dumb to buy a 400Sqft unit in BJ area. why? Own use? Seriously, so once you are married, who are selling the units to? i think many developers got greedy between 2012 and 2014 with sovo and soho,s this Rev O is one of those overpriced units whihc many buyers may potentially end up having problems disposing when they wish too. Furthermore, the REVO project didn’t provide parking lot for the buyer. The buyer shall rent the parking lot from the management which may create further cost in future as the management may increase the parking lot rental annually depending on the market demand.